Recently I was given the opportunity to check out an upcoming new game. I received a prototype copy of the game along with rules for play. These are my thoughts and opinions on the presented materials. Enjoy! 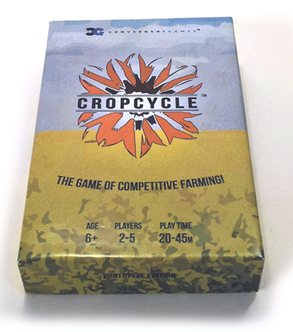 Crop Cycle is a game by Trevor Lehmann, published by Convergent Games. It is for 2-5 players. In this game, players will take on the role of farmers as they try to plant, protect and harvest their crops before their opponents. They will have to carefully select the best crops as well as be aware of the different seasons. The player that can successfully collect enough harvest points will be declared the winner. To begin, the +1 and -1 Harvest Point tokens should be placed in separate piles. The season card and reference card should both be placed in the middle of the play area. A Harvest Point token should be placed on the Spring season. The rest of the cards are all shuffled together. Five cards are then dealt to each player with the remaining cards being placed face down in the middle of the play area. The first player is chosen and play now begins. The game is played over the 4 seasons of Spring, Summer, Fall and Winter. Each season is separated into 2 phases; Planting phase and Harvest phase. The first phase is the Planting phase. In this phase, each player may perform several actions. They may plant a crop by playing a crop card in their own field face up in front of them or they can plant a weed in an opponent’s field. They may also plant 2 of the same crop if they have 2 of the same card. They may then play 1 utility card. Instead of doing those things, the player may choose to draw up to 3 cards. However, they may not exceed a hand size of 6. This action can not be performed in the same turn as a Farmer’s Auction. A Farmer’s Auction is done at the start of a player’s turn before any cards are played. This allows the player to discard their hand and draw a new hand of cards minus one card. This can only be done once a turn. The player may then play cards in the Planting phase like normal. Another action that is available is weeding. This is done during either the Planting or Harvesting phase. To do this the player discards 3 cards to remove a weed from their field. This may be done multiple times during a player’s turn, as long as they have the cards to discard. Once a player has completed their Planting phase, play passes to the next player in turn order who then performs their Planting phase. Once all players have performed their Planting phases, the Harvest phase takes place. The Harvest phase begins by checking to see if any player has no cards in their hand. That player then draws 1 card. In turn order, each player will then harvest all the crops in their field that are harvestable during the current season. Those cards are then placed in the discard pile unless otherwise noted. The player then receives Harvest points equal to the number on the crop card. If the season is Winter, all planted crops are removed unless otherwise stated on the crop card. Once all players have finished, the season then changes by moving the Season marker to the next season. The game continues back with the Planting phase again. Turn order changes to the left of the current first player. If a player reaches 5 Harvest points at any time, the game ends and that player is the winner. One last thing that should be noted, the Farmer’s Fortune cards. These are used during any player’s Planting phase immediately after the player has played a utility card. When this is played it causes both cards to be discarded from play. The utility card has no effect. However a player can play another Farmer’s Fortune card to counter effect the first card negating it instead of the utility card. There are no limits to how many of these can be played at a time. The game has some really nice looking pieces. The cards are the main focus of the game. The artwork is photo realistic. It looks a bit like what was done in the Keanu Reeves movie, ” A Scanner Darkly”. The pictures look like they were taken and then artistically outlined and painted. Whatever the case, they look really great and have a very unique look to them. The different types of cards are easy to tell apart thanks to the colored outlines. The only thing that I might have to complain about are the tokens. These are a bit small and easy to lose track of. They are fairly thick cardboard and fairly sturdy. The thing is that I would have preferred larger and bright colored tokens. The tokens all look the same with the same background whether they are Harvest Points or +1/-1 tokens. It’s easy to get them confused. In any event, that’s a minor gripe and something that isn’t that big a deal. Most of the emphasis is on the cards anyway. The rulebook for this game is small and compact. It’s themed quite nicely to fit in with the look of the game. There are only a couple of pictures that explain the iconography of the cards as well as the different types of crops. There is a section that covers all the different terminology used in the game. Of course, this being a prototype, things may change in the final design. As it is though, it’s not bad. Everything is easy to read and understand. I like the look and feel of the rules and think they are fairly well written. The game is quite simple and fun. It’s very easy to learn and play fairly quickly. Most game sessions last around 30 minutes give or take. It deals mostly with hand management but has a bit of a take that feel to it through playing weeds in the other player’s field, using special utility cards or through the use of the Farmer’s Fortune cards. I like how the game simulates farming in a very simple way through the different seasons. It’s great how certain types of crops are only harvestable in a certain season, like in real life. I like that the game has that mild educational style to it as well as being a light filler style game. Playing to 5 points can make for a fairly quick game at times. I found that you could always bump up the points and play to a higher number if you’re really looking for a longer game. I really enjoy the game and think the combination of mechanics really shine quite nicely. 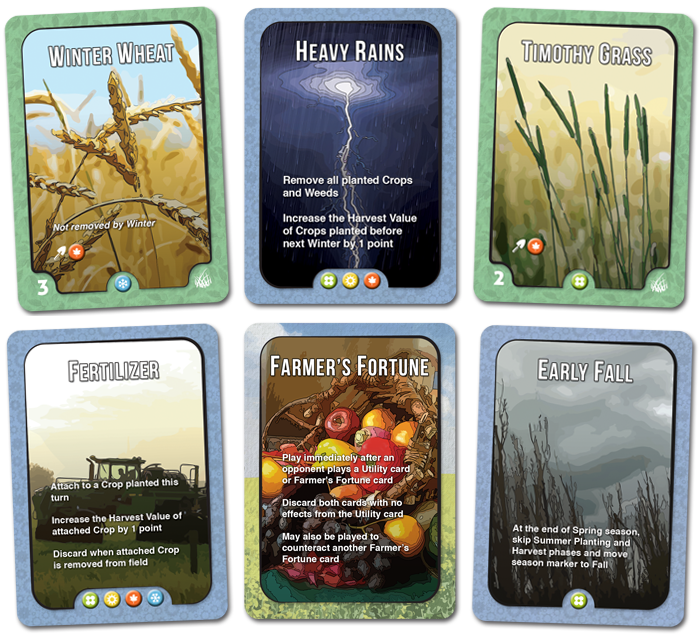 Crop Cycle is a light card game of hand management with a take that feel wrapped up in a farming theme. The game is light and easy to play. It can be played fairly quickly with most sessions lasting around 30 minutes. There is a bit of strategy to it but nothing that would be too hard for younger players to grasp. Fans of farming games like Bohnanza or even take that style games like The Red Dragon Inn might enjoy this game as well. The artwork on the cards are really great looking and have a unique style that I really enjoy. I only wish the tokens were larger and easier to distinguish between. The game is very simple and family friendly. It’s a great little game for players of all ages. I would recommend it. It beats playing Farmville for the nine millionth time. For more information about this and other great games, please check out Convergent Games at their site. Also, you can check out the current Kickstarter page for the game here. This entry was posted in Preview Reviews and tagged board, board games, card, card games, convergent, convergent games, crop, crop cycle, cycle, games, lehmann, trevor, trevor lehmann. Bookmark the permalink.